Where did all the stations go? There’s not a great deal of all the stations that used to dot the railway line. You’d have been hard pressed to even know where most of the stations were – until now. 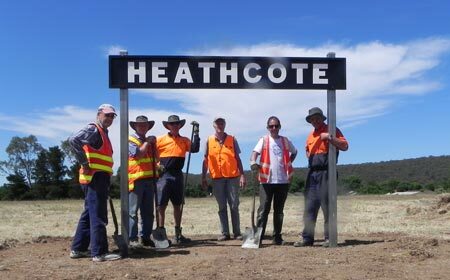 The six signs were funded by a City of Greater Bendigo community grant and a contribution from the Friends – as well as a lot of planning, post hole digging, concrete mixing and bolt-welding on the part of the Friends. 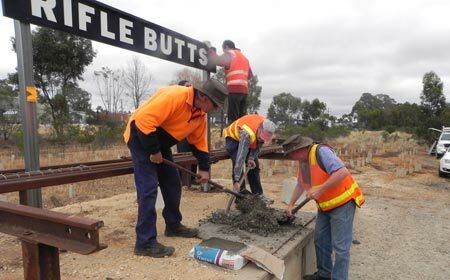 Closest to Bendigo is Rifle Butts on the reproduction platform also built by the Friends. Who named this place? 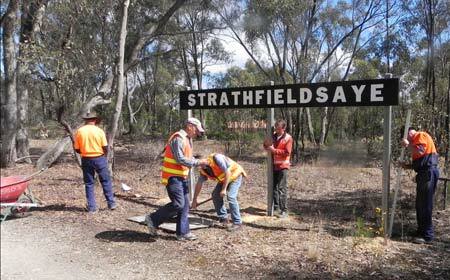 Strathfieldsaye was so long it caused all sorts of logistical troubles. At the end of the line – or is that just the middle?